No more boring snacks or ho-hum meals. Add some fun to your kids’ plates! The right touch will wow guests at a birthday party or a family meal by the pool. Just follow these 8 easy steps! Instead of serving traditional mac and cheese in a bowl, pour your mix into muffin tins for fun, bite-sized snacks. 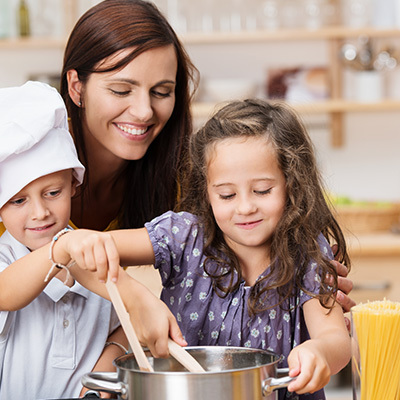 Every kid can personalize their meal with their favourite toppings: bacon, broccoli, ham, shallots, mushrooms, and more. Bake for about 10 minutes or until the tops turn golden. Then let cool before unmolding. The kids will love it! Want a great idea that’s bursting with nutritious seasonal fruit? Mission possible with watermelon cut into pizza slices! Top with some feta or mozzarella cheese and fine herbs for a beautiful burst of flavour! Food is so much more fun to eat on a stick! Spear pieces of cantaloupe or other melon onto a wooden stick so kids can eat them like popsicles. Or make icy treats filled with fresh fruit! Just add fruit slices to popsicle molds—kiwi, blueberries, mango, strawberries, and more. Be creative! Then pour in some lemonade or coconut water and freeze for about 6 hours. Fun, delicious—and nutritious! Ditch the traditional serving platter and instead serve cut veggies in clear plastic cups with a layer of dip at the bottom. Or cut a baguette into thick slices, partially hollow out the middle, and pour in some dip. Plant a few veggie sticks in the dip for a snack that won’t leave dishes to wash up! Whip up a pitcher of lemonade or iced tea using frozen fruit instead of ice cubes! Have a party coming up? Add a few drops of blue food colouring to a pitcher of lemonade or clear soft drink, then throw in a few gummy fish to create a crazy aquarium. The kids will love it! For unforgettable cakes, bake your batter in ice cream cones. Once out of the oven and cooled, top with a ball of ice cream for an original treat! The latest food trend? Popcorn with a twist! Make some paper cones and fill with them plain popcorn. Then let the kids choose their toppings! Put out cane sugar, caramel, chocolate, sea salt, and melted butter with herbs or spices. A perfect patio or poolside snack! Planning a corn roast? Try this: Cut each ear in two, then pierce with a skewer. Easy to hold—and eat! For a bite-sized version, cut each ear into thin rounds, thread on skewers and place in a pot or vase to make a lovely summer bouquet! You can also switch out traditional salt and butter for other delicious flavour combinations so guests can make their own corn creations!